This cute girl with red hair in pigtails is 16-year-old Yuka. She’s wearing a long gingham dress from Kinji resale and an embroidered black satin Cool Dragon jacket. Her accessories include plaid hair bows, earphones and a spiked necklace. Yuka’s black suede Mary Jane shoes are from Tokyo Bopper. 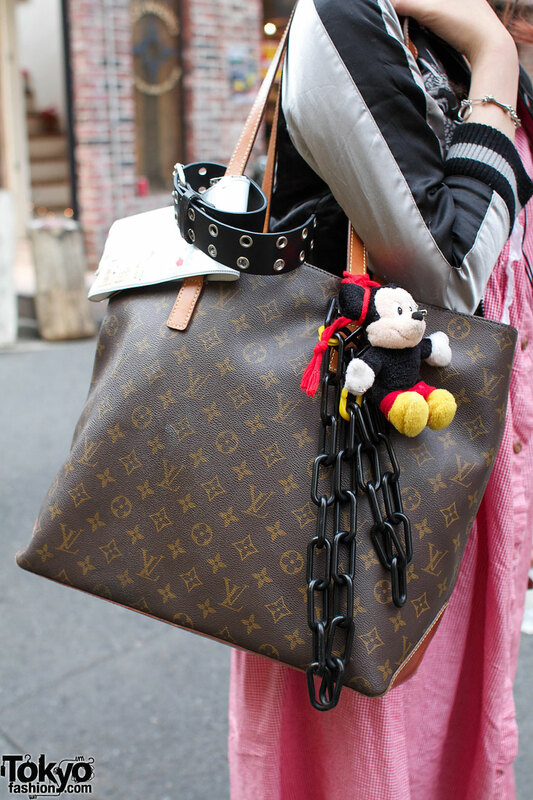 She’s carrying a Louis Vuitton bag decorated with a chain and a stuffed Mickey Mouse toy. We asked Yuka about her favorite music and she told us she likes the band Art School. -Like the earphones, bows & mickey mouse plushieeee! omg she is so cute and cool at the same time O.O looooove! especially her hair! 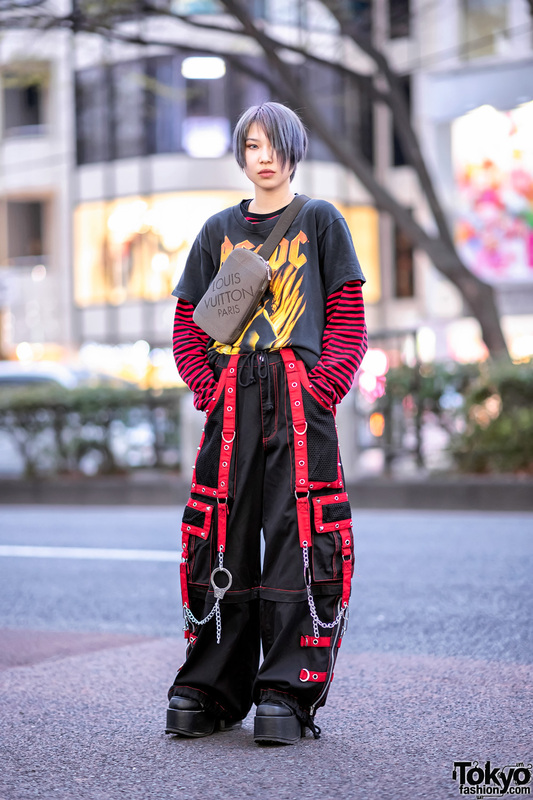 Very cool style and excellent photos. Great portraits and love the details on the clothes with the background blur, very cool. This is one of my recent favorites—a perfect blend of sweet and rock style. She looks adorable and young but not childish. And the length of the dress is so unusual!! Her shoe was pretty Gud and luvly……. she’s so gorgeous and just emits waves of cooool @_@ star power! badass. shes like “ew, dont touch me.” so boss. This is one of the best pics I’ve seen on this site in awhile. She rules! I love the mixture of the whole vintage/the virgin mary/antique style mixed with a darker puk element. So awesome. And Tokyo Bopper shoes always impress me, as well as this kind of vintage jacket. **For street fashion ILLUSTRATIONS, check out my site! That’s just awesome, totally cool.